Fig. 65. Typical Retaining Wall. 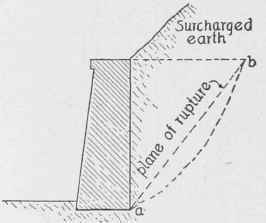 φ = The angle of repose with the horizontal - that is, the angle at [which that kind of earth will remain without further sliding. An inspection of Equation 6 will show that the pressure E is greater for small values of φ. The angle of repose for various materials is not only variable for different grades of material, but is variable for the same grade of material under various conditions of saturation. A value of φ which is frequently adopted is 30°. This is considerably lower than the usual true value of φ tor dry material, and is usually a safe value of φ for any material (except quicksand) either wet or dry. The adoption of this value, therefore, generally means that the result is safe, and that the factor of safety is merely made somewhat larger. What will be the pressure per foot of length of the wall, for a wall 18 feet high, the angle of repose for the earth being assumed at 30°? Fig. 66. Pressure on Retaining Wall. = tan2 30° X 16,200 = 5,400 pounds. Using this value of φ = 30° gives us the simple relation that E = 1/6 w h2, or one-sixth of the unit-weight of the earth times the square of the height, for a wall without a surcharge.